Deborah H. Atkin, M.D. is announcing the launch of a new website to enhance her patients’ experience with her San Diego, CA dermatology practice and give visitors a virtual tour of Dermatology & Laser of Del Mar. 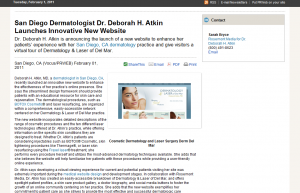 Deborah H. Atkin, MD, a dermatologist in San Diego, CA, recently launched an innovative new website to enhance the effectiveness of her practice’s online presence. She says the streamlined design framework should provide patients with an educational resource for skin care and rejuvenation. The dermatological procedures, such as BOTOX Cosmetic® and laser resurfacing, are organized within a comprehensive, easily-accessible network centered on her Dermatology & Laser of Del Mar practice. The new website incorporates detailed descriptions of the range of cosmetic procedures and the ten different laser technologies offered at Dr. Atkin’s practice while offering information on the specific skin conditions they are designed to treat. Whether Dr. Atkin’s patients are considering injectables such as BOTOX® Cosmetic, skin tightening procedures like Thermage®, or laser skin resurfacing using the Fraxel laser ® treatment, she performs every procedure herself and utilizes the most-advanced dermatology techniques available. She adds that she believes the website will help familiarize her patients with these procedures while providing a user-friendly online experience. Dr. Atkin says developing a robust viewing experience for current and potential patients visiting her site was extremely important during the http://www.rosemontmedia.com/products/website-design-service and development stages. In collaboration with Rosemont Media, Dr. Atkin has created an easily-accessible breakdown of Dermatology and Laser of Del Mar, and offers spotlight patient profiles, a skin care product gallery, a doctor biography, and social media buttons to foster the growth of an online community centering on her practice. She adds that the new website exemplifies her commitment to patient care as she strives to provide the most effective and successful dermatologic care possible. Dr. Atkin earned her medical degree from the University of California in Los Angeles School of Medicine. She then completed her dermatology specialty training at the University of Arizona, Tucson following an internship at Scripps Clinic and Research Foundation in San Diego, CA. Dr. Atkin served as a surgical volunteer in South Africa for the African Medical Mission, and is an active volunteer for the American Cancer Society and the American Liver Foundation. She is a member of the American Academy of Dermatology, the American Society for Dermatologic Surgery, and the American Society for Laser Medicine and Surgery. Dr. Atkin’s Dermatology and Laser of Del Mar practice is one of the premier cosmetic laser surgery centers in Southern California. 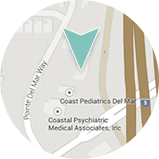 Dermatology and Laser of Del Mar is located at 12865 Pointe Del Mar Way Ste. 160, in Del Mar, CA 92014, and can be reached at (858) 350-7546, or online at https://www.dermdelmar.com or the Dermatology & Laser of Del Mar Facebook page.